Contradictory reports are coming in. A faction within Turkey’s military announced that it had seized power against president Recep Tayyip Erdogan. The statement accused Erdogan of “eroding the country’s secular traditions”, Martial law was announced and a curfew was implemented late Friday night. The president has called upon his supporters to take to the streets in a statement rebroadcast on CNN Turkey. A government spokesperson said that the attempted coup was by a faction within the military and that power still rested with the government. The Gulenists are followers of Fethullah Gulen, a US-based Muslim cleric who seaks the formation of a “Parallel Structure”. The Gulenists have denied any involvement. The group within the military responsible for the coup is a self proclaimed “Peace Council”. Their stated objective is to establish an interim government and “reinstall democratic practices”. In recent developments, the Prime Minister has said that the coup has been put down and the coup plotters have been arrested. 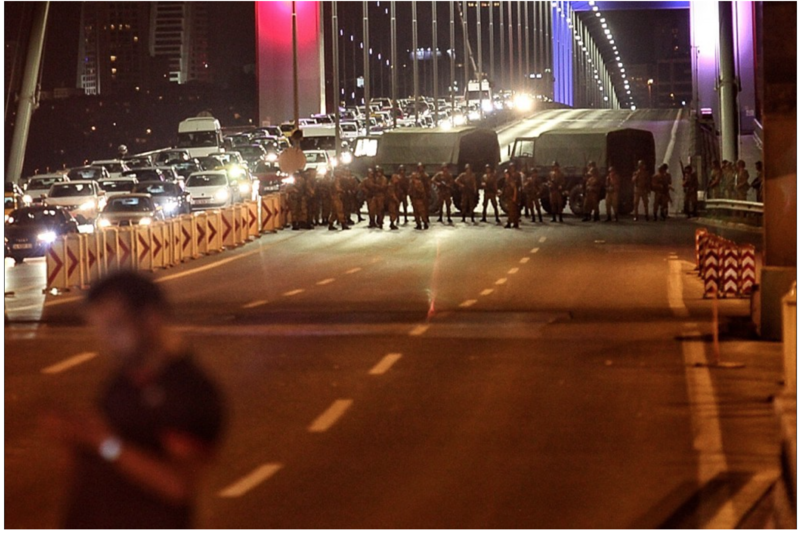 The evidence, however, points to chaos in the streets of Ankara, including the exchange of gunfire. UPDATE: Erdogan made a speech at Istanbul airport. His whereabouts have been ascertained. “Multiple reports of explosions and shooting are coming out of Ankara, with some stating that at least four explosions were heard. Tanks are opening fire around the Turkish parliament building”, Press TV reports. A military helicopter was spotted opening fire above Ankara, Reuters reports, citing witnesses. Other reports claim that a loud explosion occurred at the headquarters of state broadcaster TRT. Recent developments point to a failed coup d’Etat. Irrespective of the outcome, Erdogan’s powerbase has been weakened. The country has been precipitated into a political and social crisis. The geopolitical implications are potentially far-reaching. Who was behind the attempted coup? US intelligence was certainly informed. How does the attempted coup affect Ankara’s relations with Washington, Brussels and Moscow? Are we dealing with an attempted “regime change? How does it affect the balance of power in the Middle East? How does it affect the refugee crisis? Erdogan remains a staunch supporter (unofficially) of the Islamic State insurrection in Syria, with Turkish advisers operating within in the ranks of rebel forces. He also has territorial ambitions with regard to Northern Syria. The Turkish people are strongly opposed to Erdogan’s actions against Syria, not to mention the repeal of civil liberties and freedom of expression, including the crackdown on journalists. TURKEY’S DIRTY WAR: MP Erdem (left) exposed the Turkish regime led by Recep Tayyip Erdoğan, in running NATO’s dirty war in Syria. Together with Saudi Arabia,Turkey played a key role in the recruitment and training of the terrorists. The US air campaign allegedly against the Islamic State is operated out of Turkey’s Incirlik Air Force base. How will these developments affect the ongoing war in Syria? The US led “counter-terrorism” operation against the Islamic State is largely intended to protect rather than destroy ISIS and Al Qaeda forces fighting the government of Bashar al Assad. In recent developments, Saudi Arabia and Turkey in liaison with Washington have channelled arms, ammunition and supplies to the rebels inside Syria, not to mention the influx of new terrorist recruits across the Turkey-Syria border. Without the Erdogan government’s support, the US-NATO-Israel sponsored jihadist insurgency against the Syrian government would most probably have been defeated. In the short run, the attempted coup is likely to have an impact on the Battle of Aleppo, inasmuch as as the supply lines from Turkey may be temporarily disrupted.